A, Parameter space encompassing 3 flip angles, 4 TEs, 4 contrast agent preload and bolus dose combinations, and 2 postprocessing leakage-correction methods. 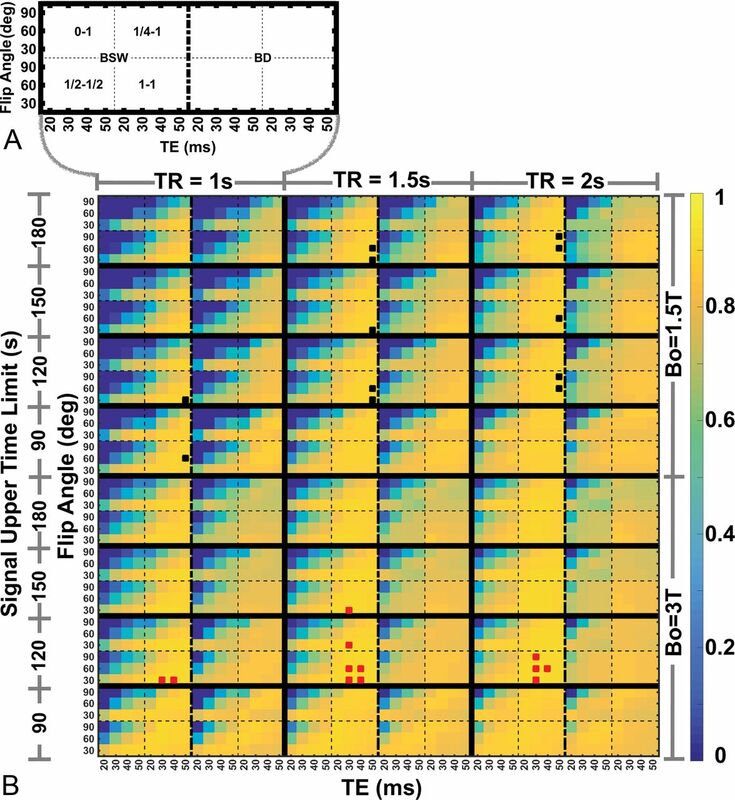 B, Heat map shows CBV accuracy and the precision index for the parameter space shown in A repeated for 3 TRs, 2 B0 values, and 4 data truncation time points. The top 1% best-performing parameter combinations are indicated by black (B0 = 1.5T) and red (B0 = 3T) marks. 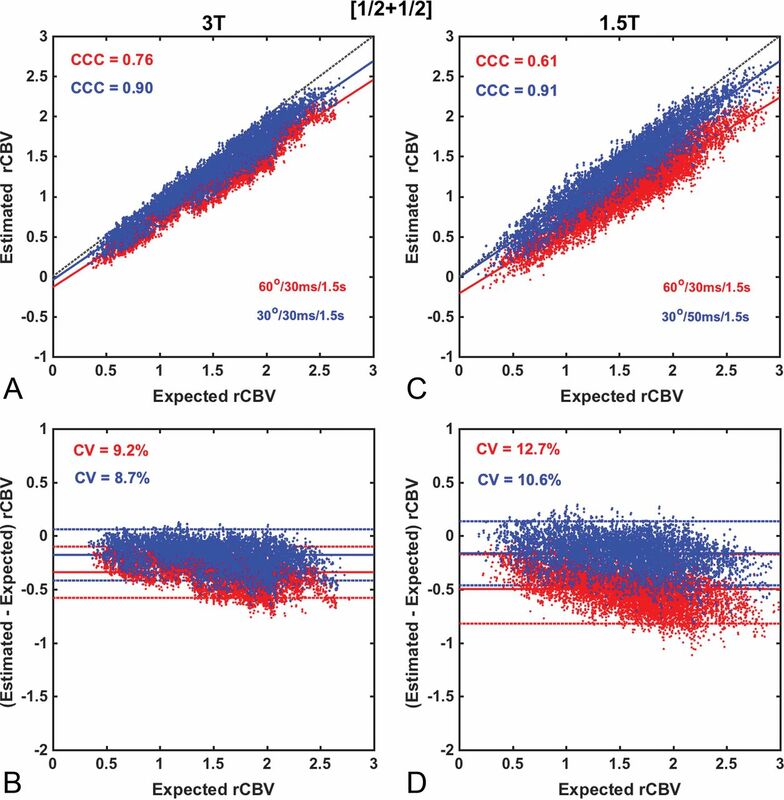 Scatter- and Bland-Altman plots comparing CBV estimates for the (1 + 1) dosing scheme at 3T (A and B) and at 1.5T (C and D) using intermediate (red) and low (blue) flip angle protocols. At 3T, both protocols yield equivalent accuracy and precision (API = 0.91), whereas at 1.5T, the low flip angle protocol provides slightly higher accuracy and precision (API = 0.89) compared with the use of an intermediate flip angle (API = 0.86). Leakage correction was applied using BSW. 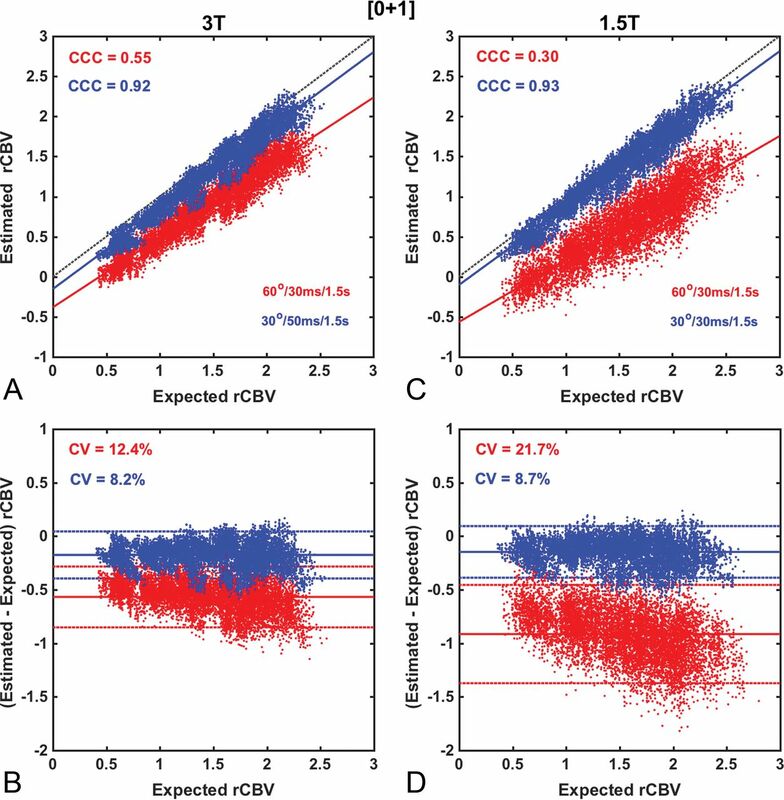 Scatter- and Bland-Altman plots comparing CBV estimates for the (½ + ½) dosing scheme at 3T (A and B) and at 1.5T (C and D) using the intermediate (red) and low flip angle (blue) protocols. At both 3T and 1.5T, CBV values measured using an intermediate flip angle were consistently underestimated, yielding lower accuracy and precision (API = 0.67 and 0.48), respectively. The use of the low flip angle protocol improved both CBV accuracy and precision at 3T (API = 0.82) and 1.5T (API = 0.80). Leakage correction was applied using BSW. 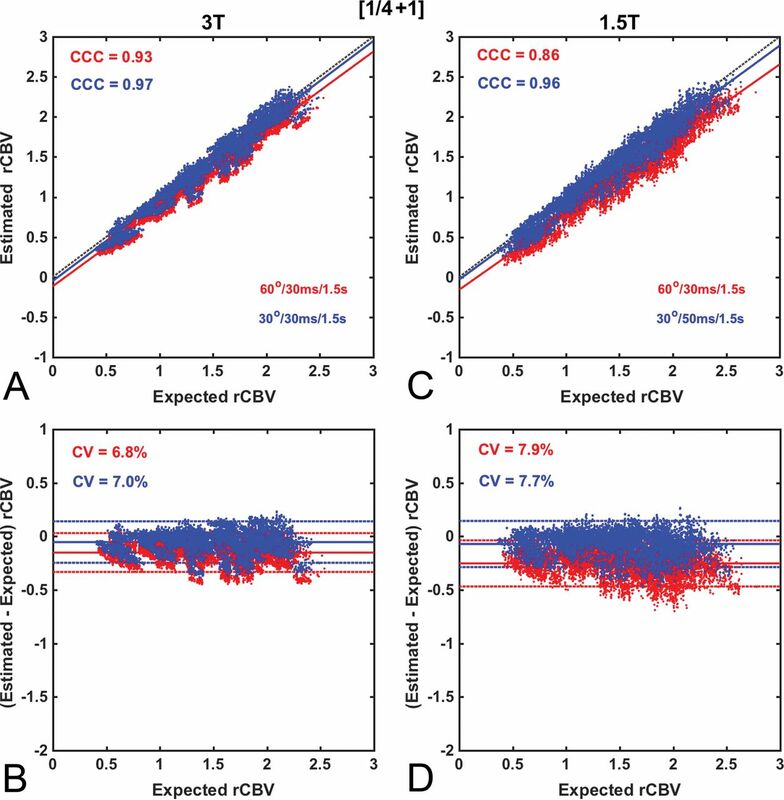 Scatter- and Bland-Altman plots comparing CBV estimates for the (0 + 1) dosing scheme at 3T (A and B) and at 1.5T (C and D), using the intermediate (red) and low (blue) flip angle protocols. At both 3T and 1.5T, CBV measured using an intermediate flip angle yielded poor accuracy and precision (API = 0.43 and 0.08), respectively. Whereas the use of a low flip angle substantially improved CBV reliability at both 3T (API = 0.83) and 1.5T (API = 0.84), respectively. Leakage correction was applied using BSW. 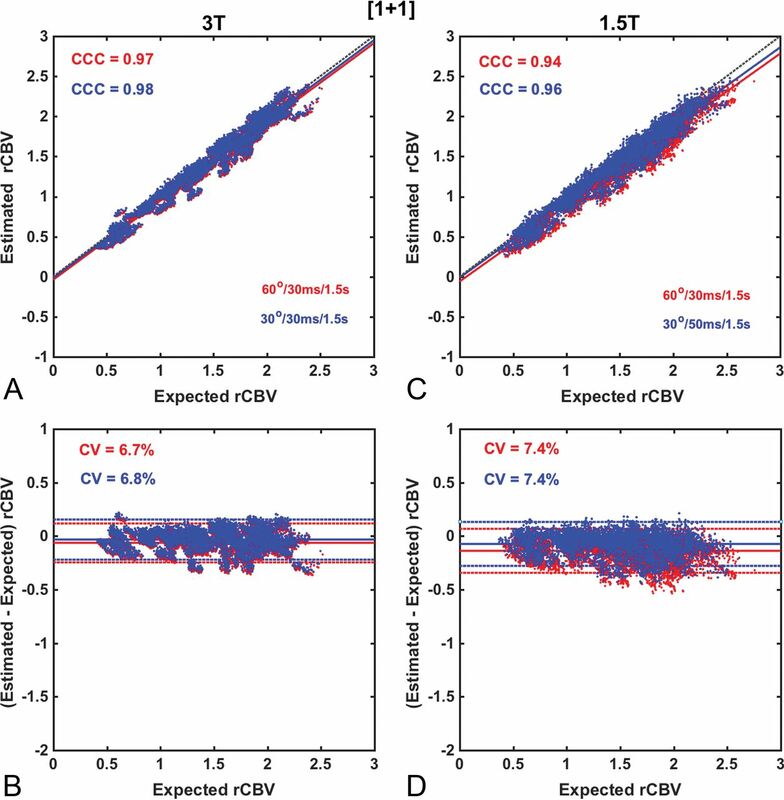 Scatter- and Bland-Altman plots comparing CBV estimates for the (¼ +1) dosing scheme at 3T (A and B) and 1.5T (C and D) using the intermediate (red) and low (blue) flip angle protocols. At 3T, both the intermediate and low flip angle protocols provide excellent accuracy (API = 0.86 and 0.90, respectively), comparable with that for (1 + 1) dosing at 3T (API = 0.91). Similar accuracy and precision levels were achieved at 1.5T using the low flip angle protocol (API = 0.89), but not the intermediate flip angle (API = 0.78). Leakage correction was applied using BSW. Note:—BD indicates bidirectional; BLS, baseline subtraction. ↵a The dose values are presented as a fraction of a standard contrast agent dose (0.1 mmol/kg). ↵a FA = 60°, TE = 30 ms, TR = 1.5 sec. ↵b FA = 30°, TE = 50 ms, TR = 1.5 sec, B0 = 1.5T; FA = 30°, TE = 30 ms, TR = 1.5 sec, B0 = 3T.